What If Ben Were One of Us? 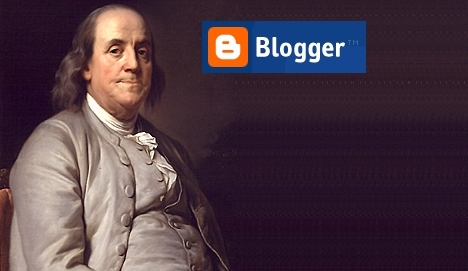 Would Ben Franklin be a blogger? It's a serious question pondered by news "gatekeeper" Walter Isaacson, once the managing editor at Time magazine and the chief executive officer at CNN. Isaacson shared some startling insights about technology and media, both past and present, at a symposium last year at the Smithsonian Institution's Lemelson Center (which studies "invention and innovation.") Isaacson told the audience that Ben Franklin was influenced by both the mechanics of 18th-century printing presses and a fickle American public. But as an afterthought, Isaacson noted that today the internet creates lots of publishers. "It's turned us back to the days when technology allowed low barriers of entry into the information transmission market." So are we all Ben Franklin? Or, to put it another way — if Ben Franklin were alive today, would he be one of us? The National Archivist of the United States, Allan Weinstein, had suddenly asked the question. Isaacson, who'd written a 608-page biography of Franklin, insisted that the answer was no — "not a blogger." The distinction was that Franklin "polished every word." But the question was too provocative to leave without more discussion. Ben Franklin would have a web site, Isaacson speculated. "It would be carefully crafted. It would be more like Andrew Sullivan than your normal blogger in pajamas." "And he would charge!" added archivist Weinstein. Yes, Ben Franklin would put his content behind a pay wall. "He would definitely charge for it," Isaacson agreed, "because he believed that if you weren't tested by the marketplace..." But then America's National Archivist cut him off with an important observation about the state of the media today. Look, you have life going in two directions, as far as technology and democracy is concerned. But at the same time you have so many decentralizing elements in the mass media, the bloggers being just one of the major ones, that there's no coherence any longer. It's wonderful. There's this great blooming, buzzing confusion in the media world which I think is, by and large, an asset to democratization. In a poignant moment, the National Archivist remembered his childhood in New York, when there were twelve different newspapers. "That dozen became the three or four that we have now, by 1950." And former newsman Isaacson saw an even harsher reality. "Having three newspapers in New York — however you want to count it — that's unusual. In Los Angeles now you're not going to have three, and the Chicago Sun-Times is about to go under." But ultimately this discussion led to one inescapable conclusion. Maybe inspired by Benjamin Franklin and America's history of a decentralized media, Isaacson made one irrefutable observation about our media landscape today. In the great American city of New Orleans, yes, there's one monopoly newspaper. "But there's about twenty web sites, and probably a thousand bloggers, all attacking the mayor of New Orleans at any given moment!" The bloggers and other new decentralized media outlets are "a wonderful asset," Isaacson added. And he pointed out that a decentralized media is almost an American tradition. "Ben Franklin arrives in Philadelphia, and it's a town of what — 12,000 people? It's got four newspapers. So what does Ben Franklin do? Get a fifth!" All the way through our life as a country, almost, you have low barriers of entry to the technology of information. People could become printers, they could have newspapers, they could be pamphleteers, they could — whatever. When radio hits, something else happens — a monopolization of newspapers... For a variety of reasons — classified ads, everything else — it was better to have one newspaper in town than seven newspapers, so you started seeing consolidation in the newspaper market. And the barrier to entry into the broadcast world was very hard. You couldn't become an NBC just sitting in your pajamas in your attic or something, because there were public airwaves, there were monopolies. There were three networks. So for a very brief period in our country's history, approximately from 1940 to the year 2000 — for just that sixty-year period — you have a concentration of media where it's a higher barrier to entry. You can't start a newspaper in town, you can't start a TV network. Then the internet blows all that away, and everybody can start web sites, blogs, email newsletters, that sort of thing, until you'll see us reverting back to the free flow of information that's more democratized. Would Ben Franklin really fit into all this? Isaacson thinks it's unmistakable. In his book he identifies Franklin as "A successful publisher and consummate networker with an inventive curiosity. "He would have felt right at home in the information revolution." How Gay Were the Hardy Boys? Franklin would be on TV!